What Happens when a Queen Bee Dies? How Can I Extract Honey From a Wild Beehive? What Is the Life Span of a Honey Bee? 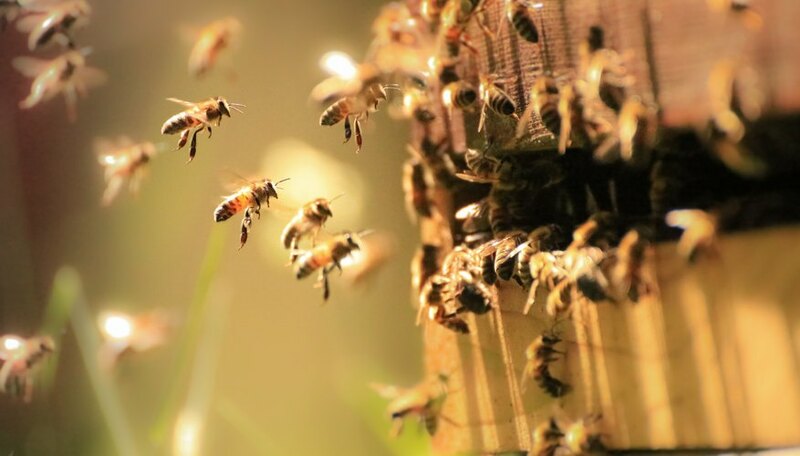 Bees play a crucial role in the world’s ecosystem. In fact, the honey bee is the world’s most important single species of pollinator, ensuring people and animals have the food they need to survive. If there were no honey bees, the world wouldn’t have broccoli, berries, apples, cucumbers and lots of other foods. Bees also produce honey and wax. 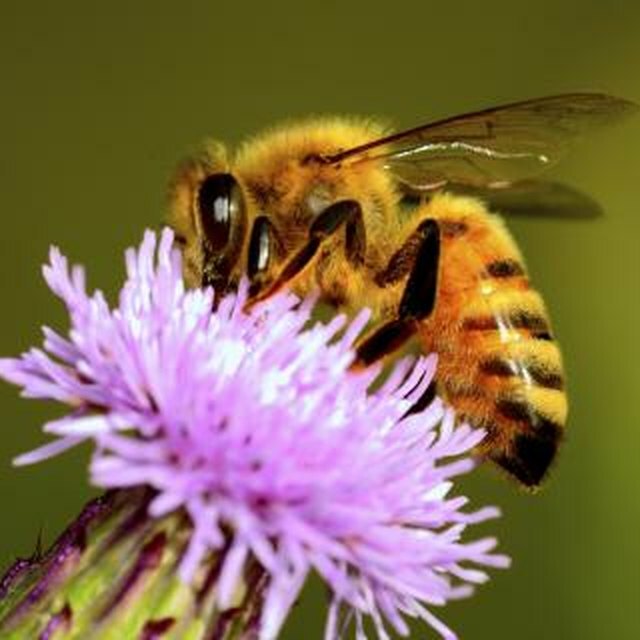 Despite having such important jobs, the honey bee has a fairly short life span. How long a honey bee lives depends on whether it is a drone bee, a worker bee or a queen bee. The lifespan of a honey bee depends on the type of bee it is. Drone bees (male bees hatched from unfertilized eggs) live for around eight weeks. Sterile worker bees tend to live for up to six weeks during summer and five months or more during winter. However, the queen bee, the only fertile bee in the colony, can live for several years. A honey bee's life cycle consists of three stages: the larval stage, the pupal stage and the adult stage. Collectively, this is known as complete metamorphosis because the form of the bee changes drastically from the larva to the adult. The larval stage is similar for worker bees and queen bees, which are both female bees that hatch from a fertilized egg. Worker bees, drone bees and queen bees are all fed royal jelly in their first few days as larvae, but after that only the queen bee continues to receive the royal jelly, supplemented with honey toward the end of the larval stage. Worker bee larvae are mass-fed a compound known as "worker jelly" or "brood food," while drone bees, male bees that hatch from unfertilized eggs, are fed a modified version of the worker bees' diet, including increased quantities of pollen and honey, during the larval stage. During the pupal stage, the bees form wings, legs, internal organs and other adult body parts, using the stores of fat they accumulated during the larval stage. Small hairs also grow on the bee's body. Typically, the total time it takes to become a fully developed adult bee is around 21 days for workers, around 24 days for drones and around 16 days for queen bees. Queen bees develop faster thanks to their rich diet. The honey bee queen is also the largest of the bees in a colony, measuring around 2 cm – about twice as long as a worker bee. Drones are slightly bigger than workers, but never as big as queens. A bee colony, an extremely organized, sophisticated society, is made up of three castes (categories): A single fertile queen bee, hundreds of male drone bees and thousands of sterile female worker bees. A bee's caste, as well as the time of year in which it was born, affects its lifespan. Summer workers have the shortest honey bee lifespan, while the queen bee outlives both other castes. Adult drones have no useful purpose within the bee hive. They don't provide food, feed the young or produce wax. In fact, they waste the colony's resources and only serve one purpose: To mate with the queen bee. Drone bees first leave the hive six days after emerging from the pupal cell, flying to areas known for drone congregation and going back to the hive only when they have failed to mate. Successful maters die minutes or hours after mating with the queen, and the rest of the drone bees survive only as long as the worker bees allow them to. If there is a shortage of food, the worker bees kill or kick out the drones. Drone bees rarely survive the winter, as the worker bees want to protect their limited resources. When a drone bee is ejected from the hive, he soon dies from cold or starvation. The average life span of a drone bee is eight weeks. The first part of a worker’s life is spent working within the hive, while the last part is spent finding food and gathering pollen or nectar. Worker bees also gather water to use to cool the inside of the nest on hot days, and use water to dilute the honey before feeding it to the larvae. It is worker bees who are responsible for pollination: When they land on plants or flowers, they collect pollen dust all over their bodies, and then use their specially adapted legs to discard the pollen, leaving it on other plants. During summer, worker bees only live for five to six weeks, purely because their heavy workload often gets the better of them. This is their most active time of the year, when they spend their days foraging for food, storing nectar, feeding larvae and producing honey. Worker bees live longer in winter – five months or more – because their fat supplies increase and their well-developed glands provide food for larvae. The queen bee has a very important function within the colony, and has the longest life span by far. While the average life span of a queen bee is two to five years, queen bees have been known to live up to seven years, although this is rare. About a week after a new queen emerges from her cell, she goes on several flights in order to mate with as many as 20 drones. After the queen bee returns to lay her eggs, she will rarely leave the colony. Thereafter, the queen bee lays between 1,000 and 2,000 eggs a day inside the hive (she has enough sperm stored in her sperm pouch to enable her to fertilize her eggs for the rest of her life). If the queen bee fertilizes the egg, that egg will become female – a worker bee or a queen bee. However, if the queen bee does not fertilize the egg, it will become a male drone bee. The queen's survival in the difficult winter months depends largely on how viable her colony is. A strong group of worker bees protects the queen and regulates her temperature. The worker bees keep a close eye on the queen bee to make sure she is up to her job. If she doesn't lay enough eggs, the workers will start developing a new queen to replace the old one, a process known as supersedure. The new queen is pampered with food and affection, while the old queen is neglected and left to waste away. In some beekeeping practices, the beekeeper replaces the queen after one or two years. The life span of a bee can be affected by many factors. Often, bees die from natural causes, but sometimes they can be eaten by other animals or killed by other bees. Worker bees may die due to overwork. However, the biggest threat to bees is disease or infection, which can destroy entire colonies in severe cases. For example, the parasitic fly Apocephalus borealis forces bees to leave the hive and die, and then fly larvae emerge from the dead bees. This fly also spreads deformed-wing virus. Other threats to honey bees are pesticides, habitat loss and mites. How Do Flowers & Bees Help Each Other? Gillespie, Claire. "What Is the Life Span of a Honey Bee?" Sciencing, https://sciencing.com/life-span-honey-bee-6573678.html. 05 November 2018. How Does a Bee Become a Queen Bee? How Does an Ant Colony Operate?